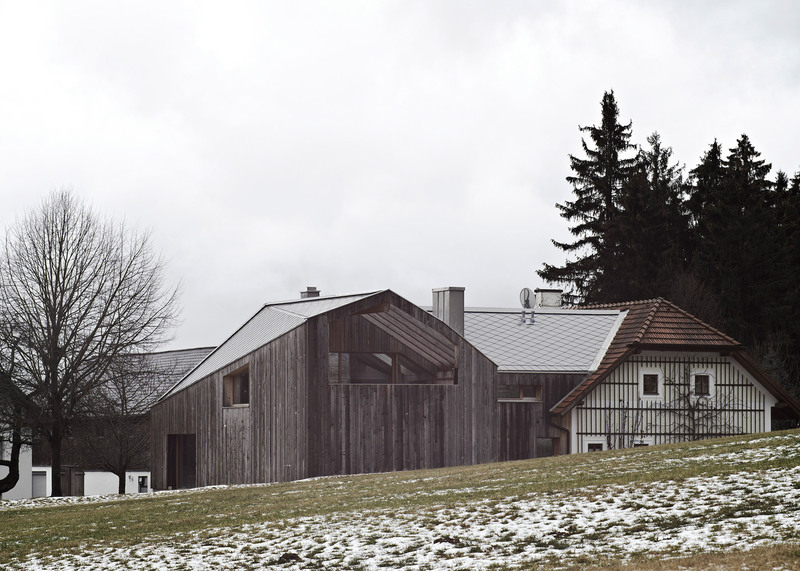 Hammerschmid Pachl Seebacher Architekten has added a contemporary extension to a traditional farmhouse in Austria, featuring rough-sawn spruce cladding and a folded fibre-cement roof (+ slideshow). 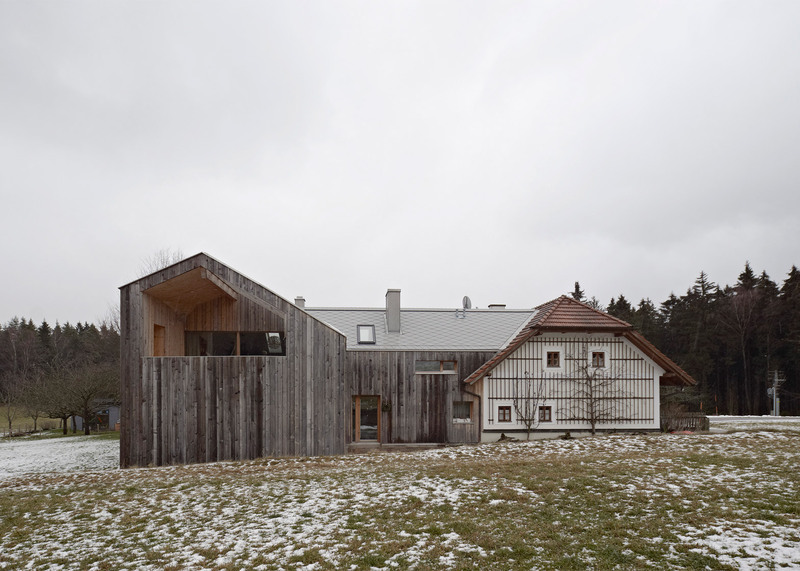 House MK is located in Bad Leonfelden, Upper Austria, and was overhauled by the Graz-based architects to create two separate living quarters, one for the client's family and another for his mother. The original property was bought and renovated by the client's parents in 1987 and used as a second home. 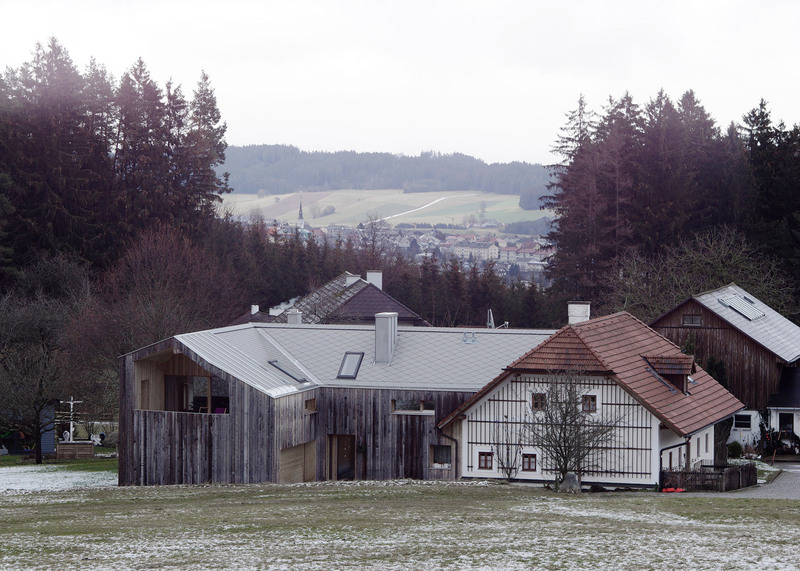 It was built in the Mühlviertel Bauernsacherl style – also known as Stone Bare – which is typical of farmhouses located in this region. It features walls of white granite blocks and a half-hip roof, meaning that the walls on the first floor are all sloped. Hammerschmid Pachl Seebacher Architekten wanted to conserve this old structure, but to also create a modern addition that complements it. 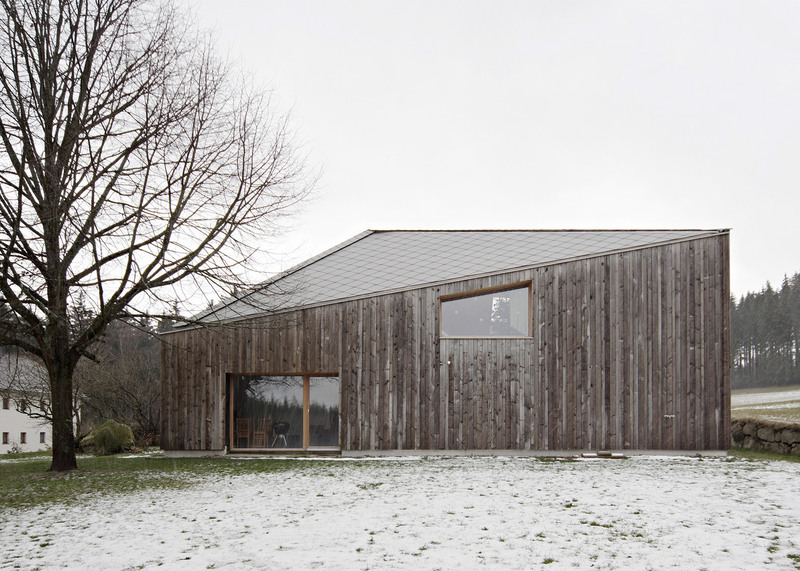 This led the team to create an L-shaped extension in roughly sawn spruce sourced from a nearby forest. 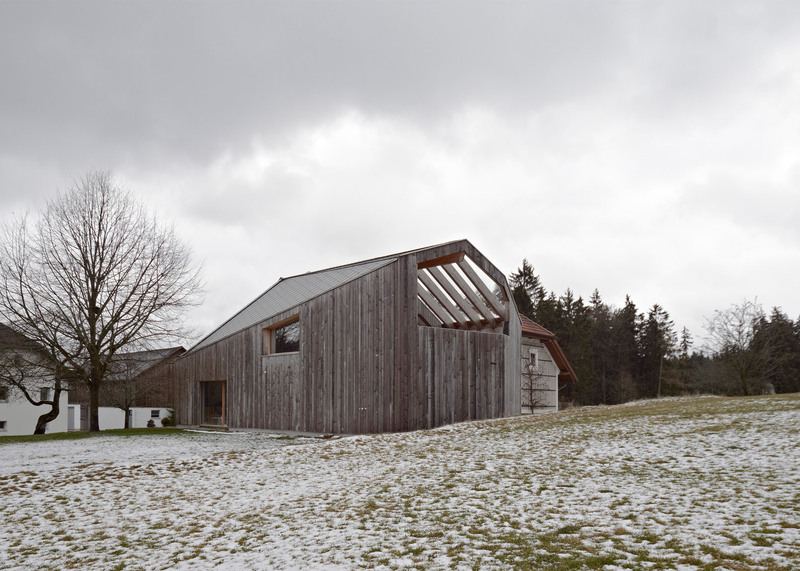 "Out of respect for the old building, we covered the newer parts with a material which is normally used for barns," studio founder Dietmar Hammerschmid told Dezeen. "So the old part of the building can be regarded as the main building." The new roof – covered in fibre-cement tiles – slopes up from the back of the extension's longer wing towards the front of the shorter wing, where it then gradually folds back down, creating a twist on the traditional gable. "The roof construction beside the old part is completely new and respects the different heights of the existing building," said Hammerschmid. 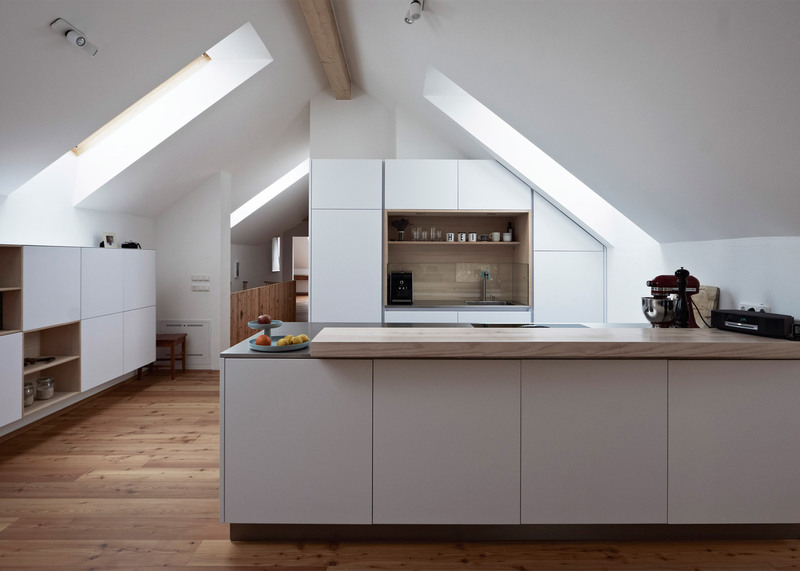 Both the extension and the first floor of the farmhouse form a two-storey home for the client's family of four. A parking garage, study, bathroom and an entrance hall are located on the ground floor. On the first floor, three bedrooms and a study are located in the old building, while an open-plan space containing a kitchen, dining room and living area occupies the new wing. This opens up to an outdoor terrace. This is space is partially sheltered beneath the roof, but some areas have been left open to reveal the timber structure and open the decking to the sky. 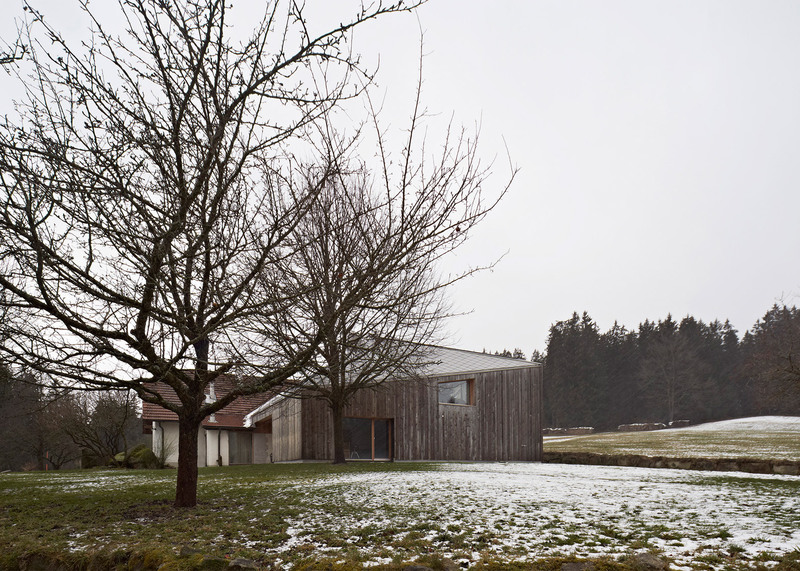 The ground floor of the farmhouse is transformed into a self-contained flat with a bathroom, bedroom, lounge, kitchen and a small winter garden, which can be easily accessed by the client's mother. Interior design is kept simple and understated. 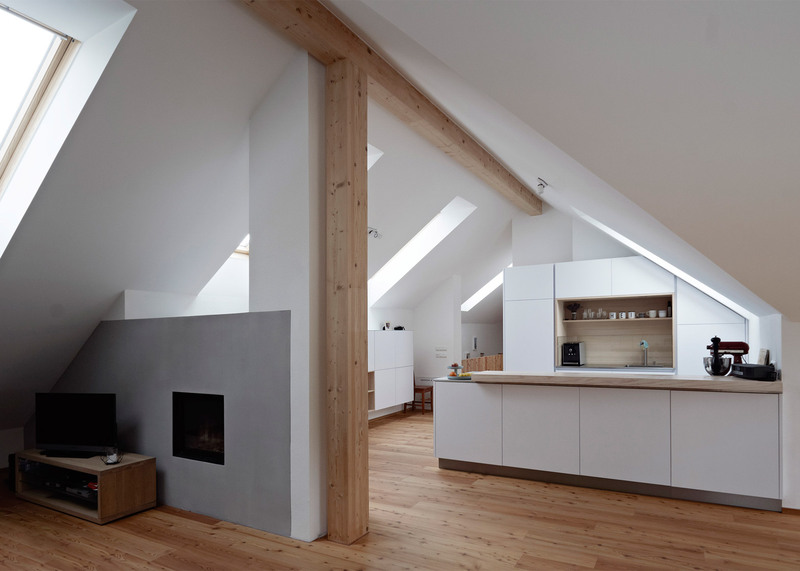 Exposed timber beams and wooden flooring are complemented by white walls and cabinetry, while skylights help to bring extra light inside. Hammerschmid Pachl Seebacher Architekten was founded by Dietmar Hammerschmid, Andreas Pachl and Franz Seebacher. Other projects by the firm include a wooden house raised off the ground on stilts and the renovation of a fourteenth century stone chapel. Photography is by Dietmar Hammerschmid.